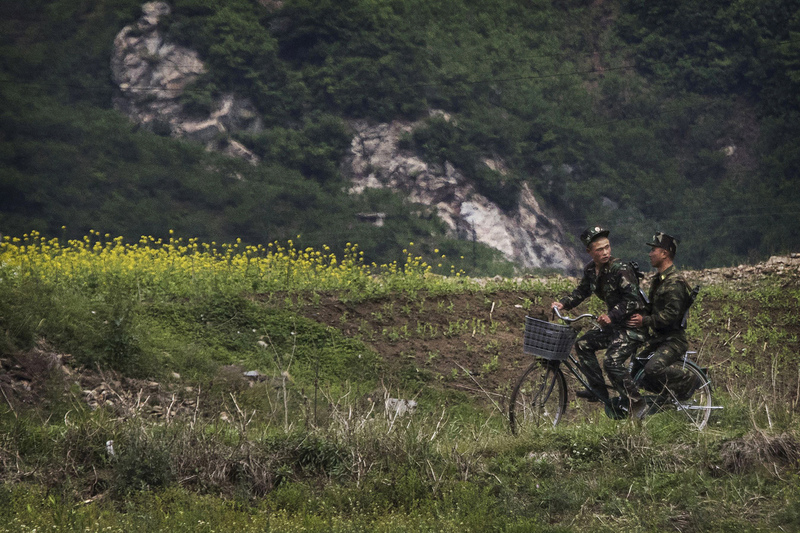 North Korean soldiers ride a bicycle near the Yalu river, north of the border city of Sinuiju, North Korea, across from Dandong, Liaoning province, northern China, May 23, 2017. North Korea is a mystery to nearly everyone—even those who have dedicated their lives to studying the country, including Korean experts based in Seoul, national security experts in Washington or Beijing, and a variety of foreigners who have spent extended periods studying in or reporting from the North. There is great uncertainty about what the country’s leaders really think of China, how self-sufficient the North’s economy actually is, and even the background of the “respected” leader, Kim Jong-un, beyond a few seemingly random details (he studied in Switzerland and likes basketball and Whitney Houston, for example). What are the prospects for war and peace in northeast Asia? Evan talked with Jeremy and Kaiser about his conversations with North Korean, Chinese, and U.S. government officials and people involved in the complicated regional power play.